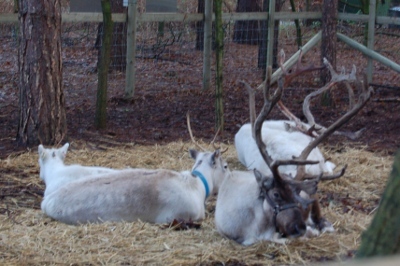 For our pre-Christmas holiday this year we went to Center Parcs Sherwood Forest near Nottingham, England. I have already commented in previous posts about how baby and child friendly Center Parcs (in the UK) are so I’ll skip those bits and just cover the unique parts of this holiday (see links at the bottom of this post to find our more about the sites). 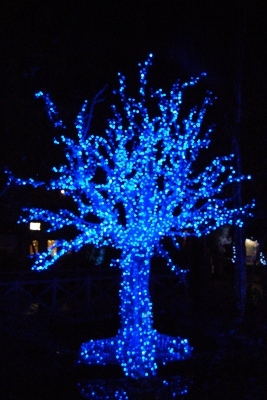 We last visited Sherwood Forest Center Parcs in December 2005 when our first child was only a small baby. Our holiday then was good, but it was nice to see some new additions to the Christmas themed holiday. 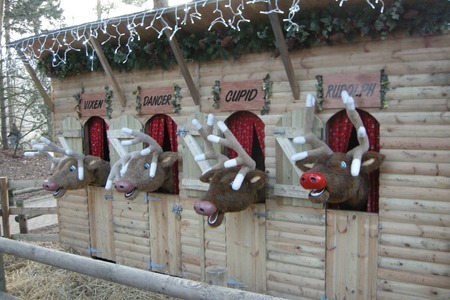 One of these is the six real reindeer next to Santa’s grotto, but also more Christmas lights animated displays and the firework display. In the past we have visited mid-week, but due to our daughter now being at school we instead went for a slightly shorter weekend break. Although both mid-week and weekend are very busy in December there was noticeably more older children at the weekend and more of the activities booked up long before the holiday started. For example in the past we have just booked the visit to Santa when we arrived and been able to pick and choose an appropriate time, but this time we booked 2 weeks in advance of the holiday and had to go for an early morning slot as the others were booked. It’s definitely worth booking activities well in advance if there is something you particularly want to do. In the past we have taken our daughter to a picnic with Rupert the Bear. This was still an option, but had a minimum age which meant that our son (age 1) could not join in properly. 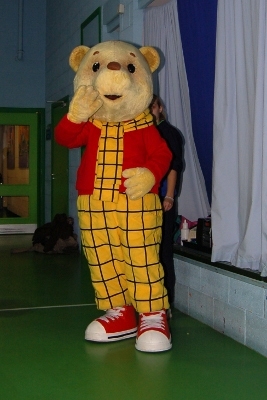 They did however have a Keep-Fit with Rupert bear which did allow younger children so we signed up for that instead. The keep fit session was really good and the children enjoyed it. It started with a bit of warm-up marching before Rupert was brought out to meet the children. Rupert then went away for a few minutes whilst the children learned a basic routine which they danced for Rupert when he returned. Rupert then joined in some dancing before posing for photos with the children. This was something both our children enjoyed and was better than the usual teddy bear picnic with Rupert. Another activity we did join in was the Sleeping Beauty Treasure Trail. This involved riding around on your own (or separately hired) bikes to find the clues and win a prize. I did this with our daughter who is 4 years old as she has done a similar thing, but on foot at Gulliver’s Kingdom in Matlock Bath. The Sleeping Beauty Treasure Trail is very long which we didn’t realise until the day, it started at the Country Club (further extreme of the park in one direction), went to the Aqua Sana (other furthest extreme) and then back again in a non-direct route. Our daughter has only a small bike with stabilisers and it was a very long trail for her to follow. Fortunately the park has a no cars policy and we only had to negotiate past a few cars. Despite the long distance our daughter loved following the trail, although she did have more than a little help from Daddy. The trail took over 2 hours (including a refreshment break) finishing after it had gone dark. Despite all this our daughter loved it. She enjoyed the prize at the end (metal badge and T-shirt) and was very proud of her achievement. I must say that I was very proud of her as well, she had gone through the entire trail without complaining despite being further than she’s ever ridden before. We didn’t join in the fairy lantern parade this year as it was about the same time as the treasure trail and we didn’t really want to take our son along as he was likely to get bored, especially if it rained – which it did. The fairy parade ends at the beach of the lake and is followed by the firework display. The firework display involved standing around in the rain for a while to make sure we had a good view (so our son didn’t have to get out of his pushchair and sit on my shoulders to see). It was worth it though as it was an excellent aerial display over the lake. Another of the festive activities was the free carol singing (local school children), brass band and male voice choir in the centre. Sherwood forest has an open centre area (unlike Winfell Center Parcs in the Lake District), which meant that although the performers had shelter the spectators didn’t. Fortunately it was dry when we listened to the carols. We had gone for a Woodland lodge accommodation again which is very new and in excellent condition. It’s a bit more expensive than the comfort plus that we used to go for, but it’s worth a little extra. One pleasant surprise (although I didn’t use it much on such a short holiday) was that we had free Wi-Fi available in our accommodation. The park advertises free Wireless Internet in certain buildings, but not in the accommodation. I’m not sure whether this is because we happened to be in an area that could receive a signal or whether this is part of some future rollout to provide Wireless Internet in the accommodation. One advantage of this is that you can review and book activities within the Villa. When accessing the center parcs website from within the park there is a different login screen which allows you to book activities by just knowing your villa number and surname without having to know the booking confirmation number which was much easier. Once again another enjoyable holiday at Center Parcs. Center Parcs is expensive compared with other self-catering holidays in the UK, but as our experience tells it’s a price worth paying. Christmas time is much cheaper than visiting during the main holiday period and the extra Christmas activities make it well worth visiting. Also see my Center Parcs 2009 photo gallery. This entry was posted on Monday, December 21st, 2009 and is filed under Babies, Children, General, Holiday. You can follow any responses to this entry through the RSS 2.0 feed. Both comments and pings are currently closed.